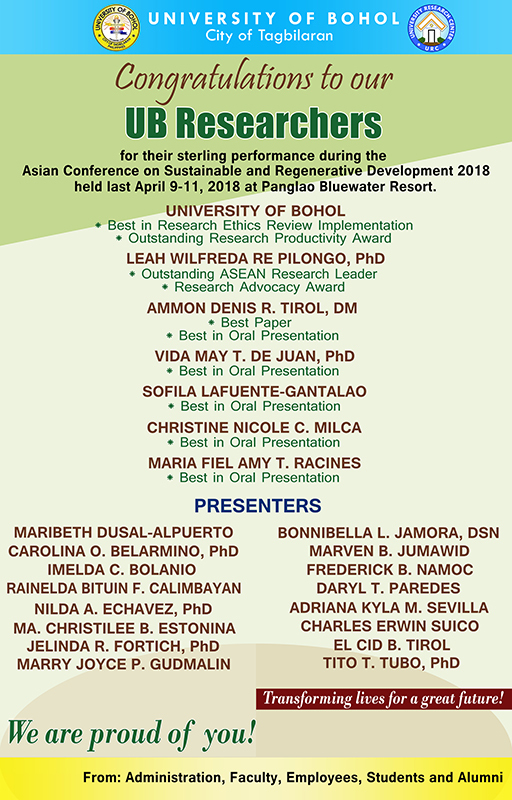 The University Research Center (URC) manages multidisciplinary/interdisciplinary and institutional research outputs and publication of the University of Bohol. The URC leads in nurturing a research climate, thereby, creating an enabling environment of open-minded, truth-seeking and well-respected experts among different disciplines. The URC actualizes the integration of research discipline in the various programs and courses that ensure integrity in providing holistic education anchored on the trinity of virtues: scholarship, character and service. The University Research Agenda is conceptualized with the collaborative contributions of the academic community of the University of Bohol. It outlines the research framework that is aligned to the strategic vision and mission of the institution. It provides the flow and mechanism to implement research policies in the academic field, the institution's operations and extension services. It specifies the research direction and priorities of the university with the end of serving the university and global community. Academic Research is clearly defined as "developmental research on curriculum and instruction, classroom research in the different courses, other basic researches in the academic disciplines." It is clearly defined in the University Research Board's guidelines, i.e., "development research on curriculum and instruction, classroom research in different courses, other basic researchers in the academic disciplines." Institutional Research focuses on the "assessment and evaluation of institutional policy implementation, efficiency and effectiveness of the University operations, impact evaluation assessment of staff development performance, cost effectiveness, and overall attainment of University vision, mission, and goals." Extension Services Research is devoted to the studies on the University's extension services, programs and projects, collaboration researches between the institution and the community, between students or faculty groups and the community or external organization. This includes baseline research or research to gather basic data for general knowledge and use for other researches.